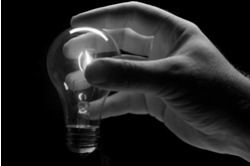 When most of us think of a light bulb we think of the normal domestic light bulb that most of us grew up with. They were the only type of bulb available at the time and were everywhere we looked. They were available in a variety of wattages ranging from 25 watts to 200 watts. In those days energy efficiency was not as prominent as it is today. Although I do remember being shouted at for not turning the lights off when I left a room and the fact that electricity was not free. That was the extent of energy saving in those days. In reality, even had we wished to be more energy efficient there were no alternatives available. A typical home in the UK will spend 30% of the electricity bill on lighting. That is a massive amount of money just to illuminate the home. It is clear that we have finite resources available and that we must consume less. Initially the answer was thought to be the compact fluorescent lamp (CFL). When they were first introduced, people were trampled in the rush to get this new-fangled energy saving light bulb. In reality they were an awful compromise that people grew to hate. They took an age to get to full brightness, some taking more than three minutes. The light quality was appalling and in severe cases could cause a migraine. Most people stopped using them and reverted back to the old fashioned tungsten lamp. The prejudices against the CFL still remains today yet it is now undeserved. The fifth generation fluorescent lamps get to full brightness within 3 – 5 seconds and are available in a multitude of different colour temperatures with excellent colour rendition. CFL lamps are safe in normal use and pose no health risk. They should not be disposed of with your household waste but should be taken to a recycling centre or your local lighting shop who will dispose of it for you under the 2007 WEEE (Waste Electrical and Electronic Equipment) directive. It has been estimated that if people in the UK switched to using energy saving lamps it could reduce the amount of carbon dioxide released into the atmosphere by 2.3 million tonnes a year. In the recent past LED light bulbs have become a reality, although initially they were of poor quality and had a harsh output. They are the most efficient type of lighting available today and are now a realistic alternative to many traditional lamps. They are durable, contain no mercury, are easily disposed of and can last for over 50,000 hours. LED bulbs are available in a wide range of colour temperatures with excellent colour rendition and a wide variety of cap types. LED bulbs have recently become popular as replacements for the halogen GU10 lamp. These are of excellent quality and utterly reliable and until very recently were the only realistic day-to-day replacement of choice. In the past year a number of quality manufacturers have made LED candle lamps a reality. The current 3w LED candle lamp is a realistic alternative to a 25w candle lamp. We have them installed in an eight-light chandelier in our showroom for you to view the excellent light output and colour temperature. Below you will find a table containing the main domestic bulb types together with information on each type. Energy rating A – 80% more efficient than Tungsten lamps. LED Light emitting diode bulbs. Energy rating A – 90% more efficient than Tungsten lamps. This article is designed to make you more aware of the options available to you today rather than a definitive guide to each type. Hopefully you will now be inclined to try one of the alternatives and together we can save energy, reduce pollution and save you some money in the process. Our range of light bulbs and lighting accessories and LED light bulbs can be viewed by following the links. If you would like more detailed information on anything contained within this article or have any questions, please use the contact us tab at the top of the page or telephone 0151-650-2138 for friendly impartial advice. No more Ordinary Light Bulbs, What Now?